What is the difference between a Direct Subsidized and a Direct Unsubsidized Loan? The federal government pays the interest for Direct Subsidized Loans while the student is in college or while the loan is in deferment. Interest begins accruing for Direct Unsubsidized Loans as soon as the loan is taken out. How much can I borrow? For subsidized loans, the maximum is $3,500 for freshmen, $4,500 for sophomores and $5,500 for juniors and seniors. Undergraduates who are not eligible for Direct Subsidized Loans may borrow an identical amount in a Direct Unsubsidized Loan. Undergraduates may also borrow an additional $2,000 in a Direct Unsubsidized Loan after they have exhausted their initial subsidized/unsubsidized eligibility. Graduate students may borrow a Direct Unsubsidized Loan for up to $20,500. Undergraduates may not borrow subsidized loans in excess of their financial need (the difference between the cost of attending Drew and our estimate of your contribution to your or your child’s education). No student may borrow unsubsidized loans in excess of his/her cost of attendance. *Direct Loan Fee: The Subsidized and Unsubsidized Federal Direct Loans have a 1.066% origination fee which will be deducted from the gross amount of the loan borrowed. When are the payments due? Repayment begins six months after leaving college. Payments are made monthly, and you have 10 years to repay the loan. Maximum eligibility period to receive Federal Direct Subsidized Loans: There is a limit on the maximum period of time (measured in academic years) that you can receive Direct Subsidized Loans. In general, you may not receive Direct Subsidized Loans for more than 150% of the published length of your program. This is called your “maximum eligibility period.” You can usually find the published length of any program of study in your school’s catalog. For a student enrolled in a four-year bachelor’s degree program, the maximum period for which he/she can receive Direct Subsidized Loans is six years (150% of four years = six years). A student’s maximum eligibility period is based on the published length of your current program. This means that your maximum eligibility period can change if you change programs. Also, if you receive Direct Subsidized Loans for one program and then change to another program, the Direct Subsidized Loans you received for the earlier program will generally count against your new maximum eligibility period. Periods that count against your maximum eligibility period: The periods of time that count against a student’s maximum eligibility period are periods of enrollment (also known as “loan periods”) for which he/she received Direct Subsidized Loans. For example, if a full-time student receives a Direct Subsidized Loan that covers the fall and spring semesters (a full academic year), this will count as one year against the maximum eligibility period. If a student receives a Direct Subsidized Loan for a period of enrollment that is shorter than a full academic year, the period that counts against his/her maximum usage period will generally be reduced accordingly. For example, if a student is a full-time student and receives a Direct Subsidized Loan that covers the fall semester but not the spring semester, this will count as one-half of a year against his/her maximum eligibility period. Loss of eligibility for additional Direct Subsidized Loans and becoming responsible for paying interest on Direct Subsidized Loans: After a student has received Direct Subsidized Loans for his/her maximum eligibility period, the student is no longer eligible to receive additional Direct Subsidized Loans. However, a student may continue to receive Direct Unsubsidized Loans. In addition, if a student continues to be enrolled in any undergraduate program after he/she has received Direct Subsidized Loans for his/her maximum eligibility period, the Department of Education will no longer (with certain exceptions) pay the interest that accrues on your Direct Subsidized Loans for periods when they normally would have done so. Fill out a FAFSA and indicate you are interested in a Direct Student Loan. Your FAFSA is your loan application. Once Drew receives your FAFSA and any other required financial aid forms, your eligibility for Direct loan funds will be determined. You will be sent an email indicating that your Financial Aid Awards can be viewed on your TreeHouse account. Log on and accept your awards. Once you have accepted your awards, a link to studentloans.gov will appear on your TreeHouse account. This website will provide you with instructions on how to electronically fill out your Master Promissory Note and Entrance Interview. Students only need to fill this form out once in 10 years, so they will not be required to complete it again while at Drew. After you have filled out a Master Promissory Note, in subsequent years, you only need to continue filling out the FAFSA form and accepting your awards on TreeHouse to receive Federal Direct loan funds. The Department of Education will transmit your funds electronically to Drew’s Student Accounts Office, which will then credit the funds to your account. If you have a credit on your account after receiving loan funds, and are not on any payment plan, the Student Accounts Office can usually mail you a check for the credit on your account 7-10 days after you call them with your request (973-408-3114). What is an Entrance Interview? Entrance Interviews are conducted when a student first borrows money through a Federal Direct Loan program. The purpose of the Entrance Interview is to acquaint the borrower with the terms and conditions of the loan. Entrance Interviews are required before any loan funds will be disbursed to the student’s account. If Drew receives loan funds and the student fails to complete an entrance interview in a timely manner, the loan funds will be returned. CLA, Graduate, and Theological students who are first-time borrowers, regardless of their year in college, need to complete an Entrance Interview. All students are encouraged to fill out an Entrance Interview online at studentloans.gov. What is an Exit Interview? Exit Interviews are conducted for students who have borrowed money through a Federal Stafford and/or Federal Direct Loan program (see below) and are ready to graduate or are registered less than half-time. Students need to complete the Exit Interview before graduating. The Exit Interview ensures that student borrowers know who their lenders are, how much they have borrowed, and understand the forbearance process and the terms and conditions of their loans. All students are encouraged to fill out an Exit Interview online at studentloans.gov. Maximum Annual Loan Limits: There are limits to the amount of Federal Direct Loans a student can borrow each academic year. The charts below outline these limits. A student’s actual eligibility may be less depending on the cost of attendance and any other financial aid for which they are eligible. The Office of the Ombudsman is your last recourse after contacting your lender, federal servicer and Drew’s Office of Financial Assistance. How much can I borrow? At least $200, but not to exceed the student’s estimated cost of attendance minus the student’s estimated financial assistance for the academic period. What are the interest rates? You pay a 4.264% origination fee that is deducted immediately from each loan disbursement. Direct PLUS Loans made during the period of July 1, 2018, to June 30, 2019, have an interest rate of 7.595%. When are the payments due? Payments are due monthly and begin 60 days after the disbursement of the first loan funds. Parents and graduate students may apply to the Department of Education for a deferment of payment during the enrollment period; however, interest will continue to accrue during the deferment period. The number of years allowed to pay back this loan is 10 years; however, students and parents may apply for a consolidation or an extended repayment plan. Log on to studentloans.gov, where instructions on how to electronically apply and fill out your master promissory note are provided. The Department of Education will transmit your funds electronically to Drew’s Student Accounts Office, who will then credit the funds to your account. A few words about choosing a Private Educational Loan Lender. Many students and parents consider private loan programs as a source of funding after exhausting all opportunities available from federal and state aid programs. As always, taking on debt for any reason should be done deliberately and only for the amount necessary. If you plan to borrow a Private Educational Loan, you must select a lender (the institution from which the money is actually borrowed). You should make an informed decision when selecting a lender, as all lenders are not the same, and you will be entering in a long-term relationship with that institution. Reasons for selecting a particular lender vary from person to person. Some people choose a lender based on name or brand recognition or reputation, or they prefer the immediate benefit of below-market processing fees. Other people are interested in borrower benefits in repayment, such as an interest rate reduction as a reward for making consecutive on-time payments. We encourage families to use the lender and the loan product that best meets their needs. Please visit our ELM SELECT WEBSITE to begin the process of researching and selecting a lender. This site allows you to compare and contrast various loan products offered by several different lenders that Drew students have a history of borrowing from. Please note that you are not required to use one of the lenders that appear on this site. 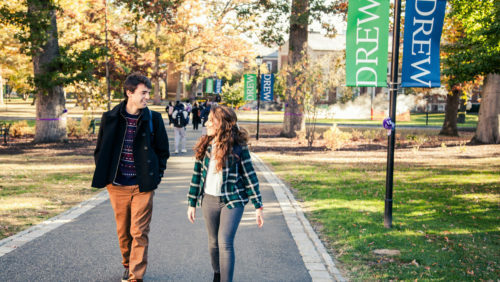 If you have any questions regarding the private educational loan process, please contact Drew University’s Office of Financial Assistance at 973-408-3112 or finaid@drew.edu. Who can apply? To be eligible for a United Methodist Loan, you must be an active, full member of the United Methodist Church for at least one year prior to applying, a citizen or permanent resident of the United States, admitted to a degree program in an accredited college or university and maintaining at least a C average. How much can I borrow and what are the interest rates? Up to $5,000 per year for full-time students. Credit-worthy cosigners are required for all loans and all loans are subject to a 1.072% origination fee. There is a 4% interest deferred loan or a 3.75% interest non-deferred loan with immediate repayment. Repayment on the deferred loan begins no later than six months after the student graduates or withdraws from school, and the final payment is due no more than 120 months (10 years) after the first payment is due. The non-deferred loan will accrue less interest over the life of the loan. Application: Visit the United Methodist Church loan website for details and an application, or contact umloans@gbhem.org. If you have not previously received a Direct Loan, you must complete a Direct Loan Master Promissory Note (MPN). Although you may have previously signed an MPN to receive FFEL Program loans, a FFEL MPN cannot be used to make Direct Loans. The MPN is the legal document through which you promise to repay your Direct Loans and any accrued interest and fees to the department. It also explains the terms and conditions of your loans. A Direct Loan MPN can be used to make loans for up to 10 years. You may complete a Direct Loan MPN electronically via the StudentLoans.gov website. To complete a Direct Loan MPN electronically, you must have an FSA ID. The FSA ID is the same FSA ID used to complete the Free Application for Federal Student Aid (FAFSA). In some cases, you may need to complete Direct Loan Entrance Counseling. If you are an undergraduate or graduate/professional student and have not previously received a FFEL or Direct Loan program loan, you must complete Direct Loan Entrance Counseling before you can receive a Direct Loan. If you are a graduate/professional student and have not previously received a PLUS loan through the FFEL or Direct Loan programs, you must complete Direct Loan Entrance Counseling before you can receive a Direct PLUS Loan.